When it comes to combining thrilling performance features with advanced interior and safety technologies, the new 2019 Toyota Corolla clearly excels. The new Corolla engine will provide the power you need to make your way through the backroads of New York, while advanced comfort amenities allow you to cruise through Penfield in relaxation. Wondering how the 2019 Toyota Corolla compares to other compact cars like the 2018 Ford Focus, 2019 Nissan Sentra or 2019 Chevrolet Cruze? Stop by our Toyota dealership near Penfield, NY, to speak with a member of our knowledgeable Toyota sales team and discover everything the new Toyota Corolla has to offer! If you’re looking for a fuel-efficient compact car that offers exhilarating performance features, the new 2019 Toyota Corolla is right for you. Finding the car that suits your lifestyle is easy thanks to the option to choose between two new Corolla body styles: the 2019 Toyota Corolla sedan and the 2019 Corolla hatchback. As you drive through New York, you’ll take advantage of the 1.8-liter DOCH engine that outputs 132 horsepower and returns up to 40 highway mpg. * Meanwhile, standard Continuously Variable Transmission with intelligence and Shift Mode will ensure smooth driving around every twist and turn. Thanks to the standard Toyota Safety Sense™ P system, including Lane Departure Alert with Steering Assist and Pre-Collision System with Pedestrian Detection, you’ll drive though Penfield with confidence. And when you opt for the available Entune™ Audio Plus system, you’ll enjoy a host of innovative 2019 Corolla interior features such as a 7-inch touchscreen display and smartphone integration. Curious about the new Toyota Corolla configurations? The 2019 Corolla offers greater passenger volume than the 2018 Ford Focus, the 2019 Sentra and the new Chevy Cruze! Ready to get the keys to a 2019 Corolla sedan or a new Toyota Corolla hatchback? 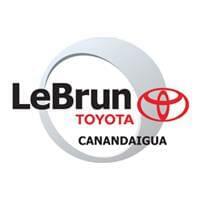 Visit our New York Toyota dealer to explore our 2019 Toyota lease and finance specials!